American Girl is celebrating its 30th anniversary. Since 1986, the business has sold more than 29 million dolls and more than 153 million books. This summer, it will release a new historical doll. CBS News went where no cameras have been allowed before — inside the design studio to get the first exclusive look at Melody Ellison, the company’s third African American doll in its BeForever historical line. For the last 30 years, American Girl dolls have brought countless smiles to faces of little girls. “I think it’s that we stayed true to our mission and purpose and while it’s easy to call us a doll company, we’ve always seen ourselves as storytellers,” said Julia Prohaska, vice president of marketing. Prohaska said their dolls come with books that tap into imaginations, while providing a rich history lesson. “We put at the center stories and advice for girls that really are intended to help them be their personal best,” Prohaska said. Many people were eagerly anticipating the arrival of the Ava DuVernay doll Monday. From refreshing constantly on the Barbie Collection website to waiting for Mattel to release the link on Twitter, some were left disappointed when it came to actually being able to buy the doll. But there were others who were lucky as well as fast enough to purchase the doll. Twenty minutes after Mattel tweeted the link to its Barbie site, DuVernay’s doll was sold out. Potential customers tweeted their anguish and dismay after not being able to make their purchase. Then Mattel informed everyone that the doll would be available shortly at Amazon.com. Some people waited for Mattel to release the Amazon link, while others searched on Amazon for the doll. And there it was, available for preorder. Once word got around on social media that the doll was already on Amazon, it was every eager consumer for him or herself. Around 1:30 p.m. EST, Mattel finally tweeted the link to the Amazon.com site. But it was too late; the doll was already sold out. More tears. More disappointment for those eagerly waiting to get their hands on the doll. I’m pretty sure Mattel didn’t expect the doll to sell out, especially since the company hadn’t planned to mass-produce the doll. But how often is a doll made in the likeness of a great black filmmaker on the market? How about never. The fact that DuVernay’s doll sold out within minutes of its release is a testament to the fact that representation matters. People want to see dolls in their image and in the image of those people they admire. If Mattel wants to continue to make an impact, someone in its R&D department better start doling out ideas about how to jump on this. A DuVernay doll is just the beginning. How about a Viola Davis doll? A Kerry Washington doll? A Denzel Washington doll? A Neil deGrasse Tyson? Idris Elba, anyone? Remember back in the day when Cabbage Patch Kids dolls were all the rage? On Monday, DuVernay’s doll and the anticipation were the equivalent. Instead of fighting in stores, people were fighting against the clock and how fast they could refresh their browsers. Not only do people want black dolls, but they want black dolls in the likeness of people they admire. 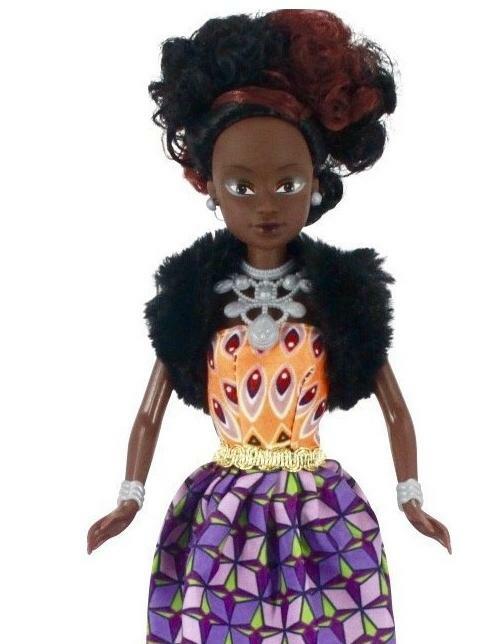 Queens of Africa, the black doll line that’s outselling Barbie in Nigeria, started as a personal mission seven years ago. Taofick Okoya was frustrated that he couldn’t find a black doll on the market for his niece. “I happen to be the kind of person that doesn’t enjoy complaining and criticizing without taking any action,” the 43-year-old businessman tells ELLE.com. So he researched making a doll that Nigerian girls could identify with: one with their skin color and traditional African fashion.